The intricate pattern makes this Sondra Roberts beaded handbag feel both unique and special. It’s still glamorous, just freshened up. 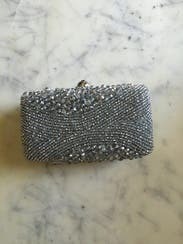 Silver minaudiere accented with faceted crystal beads. Clasp closure and drop-in chain strap. 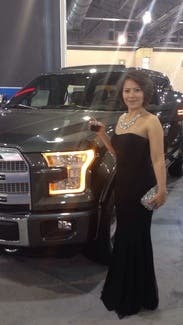 7"W X 4"H X 2"D.
Great compliment to my gala- dress !!! This bag was more beautiful in person! Great size to fit my lipstick and iPhone 6. Nice size can be held in hand easily and also fit a cell phone. The purse I got was in great shape and the beading is gorgeous! I fit an iPhone 6 (no case), hand lotion, eye drops and a small ziploc of Wheat Thins (for the kids). It was still lightweight and easy to carry. My iPhone 6 fit perfectly in this clutch, and I still had room to spare! Easy to hang on to, spacious, and pretty. Perfect accent to a traditional look. This bag is a statement accessory. Paired with a more traditional dress it really is highlighted. Only down side was my 6 plus could not fit in it, however, sometimes it nice to leave your phone home for the night. Gorgeous piece which I hope to have the opportunity to rent again. Went great with my wedding suit and the belt I wore with it. The bag was great. It's on the small side, as most people described. I fit just a few things: phone, lipstick. 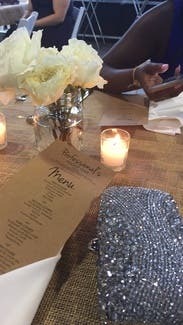 This clutch looked great and it had enough room for 2 phones (both were iPhone 5) plus some lip gloss and an ID. The clutch is perfect!!! I wish I could have kept it. I rented it for a black tie event. I didn't use the chain strap that comes with it. 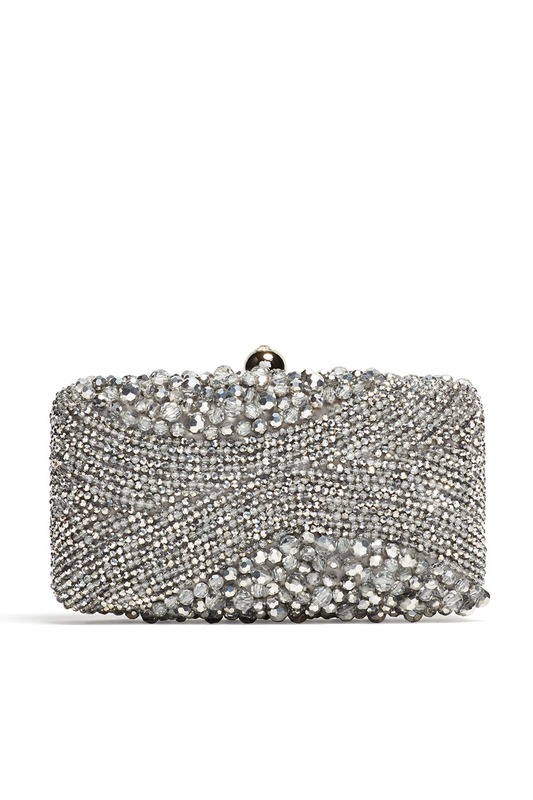 I love the texture and look of the clutch. If you have anything in the silver/white tones, this will definitely work!!! This bag was exactly what I wanted! Glamours, vintage and classy! I loved it! Great bag. Very glam!!! Love that the crystals are different and not just the same. It doesn't fit much but it was manageable. I held my phone but I was able to fit some cash, lip stick, lip liner and my car key. It looked great with my dress for prom! Very shiny and perfect for formal events! This added just the right amount of sparkle! Great clutch! I just wish it was a little bit bigger, I had some trouble fitting my Galaxy S5 into it. Hi, did you have a case on your Galaxy S5? I am thinking of renting this purse and want to make sure it will fit, even if it is a bit snug. AMAZING CLUTCH, Sad I couldn't use it! 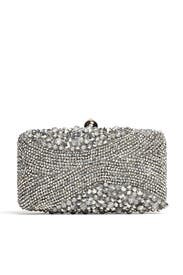 I rented this clutch to go with a BCBG White sheath dress I rented. 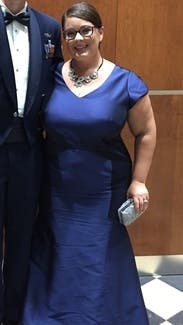 Unfortunately, the dress didn't quite fit in the bust area, so I had to replace it. The dress I replaced it with was gold and black, so this clutch obviously wouldn't work for the look. It's relatively light for the bead work and it's a nice size. While testing it out, I was able to fit my iPhone 6, lip gloss, and a small Coach credit card holder in it. The bead work is really well done on it and, when I ordered it, I was afraid that it would be really delicate (like so many beaded purses can be), but it seems really well put together. 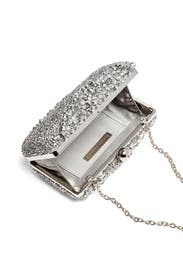 I was looking for an evening bag to hold my iphone 6, a lip gloss etc, and it worked well. 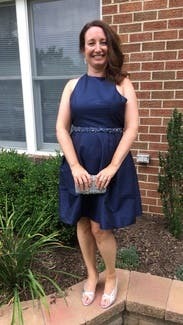 It was my first time using Rent the Runway, and I would definitely do it again! Super easy process. Beautiful wedding purse! 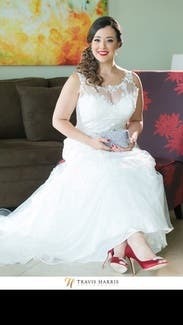 It was able to fit my touch up makeup (but not my iphone 6) and small essentials that I might have needed during my wedding reception. Ideal size and so beautiful! I used this to hold my phone, lipstick, bobby pins and it was perfect for the wedding day. So much sparkle and absolutely stunning. I wish I owned it. So glamorous! Very sparkly and blingy in person. The details of the clutch were exquisite and it wasnt too heavy. The silver was perfect. 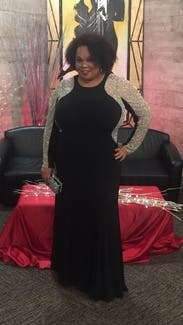 Not too light or dark and it went great with my Louboutin Strappy sandals that i wore for the reception, my rings and jewelry. I also changed into a silver dress at the end of the night. Perfect. This is adorable. My iPhone 6 fit as well as some make-up essentials for the night. Perfect size. 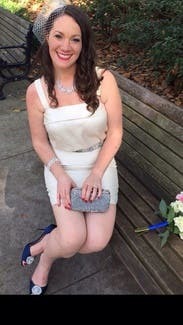 I wish I had time to take pics - I used this at my daughter's wedding - perfect for NYE wedding! Great size for lipstick and a phone - still room for ID , cash and credit card - easy to hold! Beautiful clutch in a great size! This clutch was a great size and had a strap you could keep out or tuck into the bag. It had just enough space for an iPhone, lipstick and my ID. Also, it was just GORGEOUS! 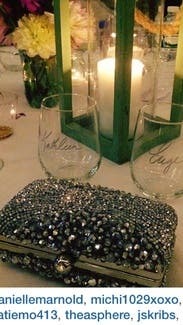 This clutch was perfect for the wedding I attended. It was the perfect size and the perfect amount of shine. very pretty clutch that fit everything I needed for the night. 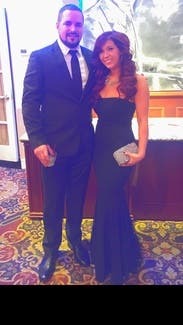 It was a simple elegant/glam clutch that fit such a fancy occasion. Loved it! I see that some people complain that it's small, but I feel the size was just perfect. All I needed for the night was my cc's, cash, phone, lipstick, and gum. Would rent again.